SHINGLEHOUSE, Pa.---Marjory “Margie” Stilson, 93, of Shinglehouse, passed away unexpectedly on Saturday, August 25, 2018, in UPMC Cole, Coudersport. Born on December 25, 1924 in Shinglehouse, she was a daughter of Charles J. and Ethel H. Anders Osborn. On December 16, 1972 in Bolivar, N.Y., she married Robert R. “Bob” Stilson, who passed away on June 20, 2008. 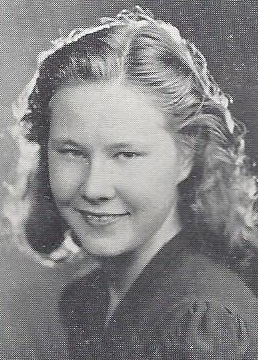 Marjory was a graduate of Shinglehouse High School, Class of 1942. She was employed at the former Eldred Munitions Plant during World War II. She later was employed at Red’s and Trudy’s in Portville, N.Y., the former Olean Tile Plant, and by the former Pine Wood Diner in Portville. Before retirement, Margie was last employed at the former St. Francis Hospital in Olean, N.Y.
She loved gardening, still having her vegetable garden this year. She enjoyed baking. Marjory was a loving and devoted wife, aunt, sister and friend. Surviving are a nephew, Charles F. (Tina) Harris of Shinglehouse; two nieces, Donna S. Bianchi of Henrietta, N.Y. and Georgia L. Cooper of Port Gibson, N.Y.: and several grandnieces and grandnephews. In addition to her parents and husband, Marjory was predeceased by a sister, Margaret M. Harris; and twin brothers, Elbert A. “Bert” Osborn and Robert C. “Bob O.” Osborn. In keeping with Marjory’s wishes, there will be no public visitation or funeral services. Burial will be in Maple Grove Cemetery, Shinglehouse, alongside her husband. In lieu of flowers, memorials in Marjory’s name may be made to the Shinglehouse Volunteer Ambulance Association, PO Box 98, Shinglehouse, PA 16748 or to the Shinglehouse Volunteer Fire Department, PO Box 475, Shinglehouse, PA 16748. Marjory’s family has entrusted her care to Kevin J. Dusenbury, funeral director/owner of the Virgil L. Howard Funeral Home, Shinglehouse.